If all the top class mountain biking and trail running in Coed y Brenin are not enough, or you just want to try a different activity during your stay here, then we can supply a qualified Mountain Leader to ensure you have a safe and enjoyable day. We have lead two trips recently, in contrasting conditions as spring in Snowdonia brings a variety of weather. 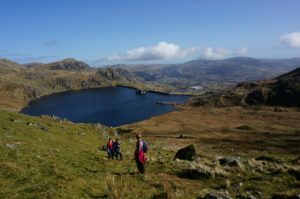 The first walk started at Tanygrisiau near Bleaenau FFestiniog, and headed up the tarmac to the Stwlan Dam, before climbing the summits of Moelwyn Bach and onto Moelwyn Mawr. This day we were treated with blue sky, with a fresh breeze to remind us it was still early spring. After a leisurely lunch in the sun, we descended down through the fascinating and impressive ruins of the old mining community at Rhosydd Quarry, before continuing through Cwmorthin and returning to Tanygrisiau, all having caught the sun. We headed back to Mostyn Cottage for tea and cakes, and a short nap listening to the river, satisfied with a good day out. 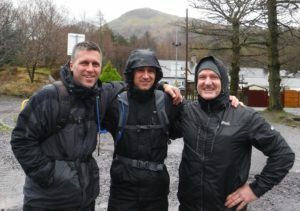 Five days later, and a new group of guests were preparing for an ascent of Snowdon by donning full waterproofs, hats and gloves. 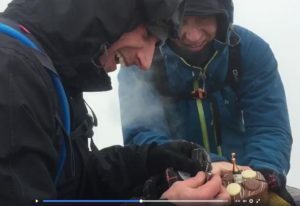 The aim was to celebrate Dominic’s 50th birthday, and despite the strong winds and rain forecast, a cake and candle was packed for the summit. With the forecasted conditions, a walk up the Llanberis path was the plan for the day. With the wind on our back, the walk up was a mix of thick cloud with occasional glimpses of the mountains surrounding Snowdon. After a steady ascent, with a few stops for pictures when the clouds parted, we made the top, and had the summit trig point to ourselves, a rare occurrence on the top of Snowdon. A bit of perseverance got the candle lit whilst we sung happy birthday, before retreating to shelter for a flask of coffee. On the descent we were treated to a clearing of the clouds, giving us great views of Snowdonia, and we returned to the car park in sunshine to finish a memorable birthday celebration. 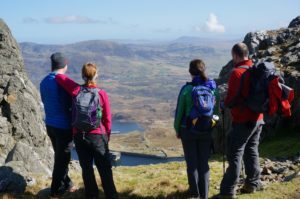 These two walks are just a sample of what is available here in Snowdonia. If you are thinking of staying and would like some advice, or a guide for the day, just drop us a line and ask.